There is no arguing the facts: I have a lot of pens. A few weeks ago, I went through my stash with the idea that I needed to thin the herd. I was successful, and you, the wonderful Pen Addict reader, are the beneficiary of my reorganization. I am going to stuff five envelopes full of pens and paper from the goods in the photo above and ship them off to the lucky winners. 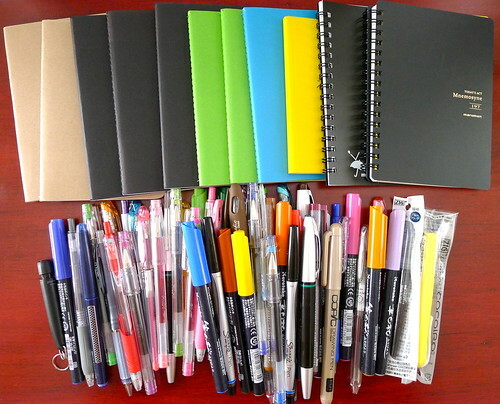 There are all kinds of great products included: Pilot Hi-Tec-C, Pentel Slicci, Sharpie Pen, Copic, Zebra, Sharpie, and more. All of the products are new or like new and in good working condition. If anything, I may have used the pen for a few test scribbles and that is about it. There may also be one or two pages missing from the spiral notebooks, but otherwise they are in good shape. Leave one comment on this post anytime between now, and Wednesday night at 11:59 PM Eastern Time. You are limited to one entry. This contest is limited to US residents only. For this contest, I will pick five winners at random from the comments section of this post. The comments will be numbered in the order they are received, i.e. the first comment is #1, the second #2, and so on. The Random Integer Generator at random.org will be used to pick the number of the winners. The contest winners will be posted on Thursday, April 26th. The winners will have one week to email me at the address posted in the right sidebar. Posted on April 24, 2012 by Brad Dowdy and filed under Giveaways.